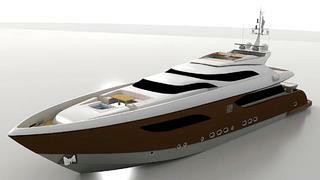 News comes from Nedship that they have an under-construction 41m trideck motor yacht for sale, hull #3 from a series. Although well into the build process, this 41m offers the opportunity to fast-track a build for possible delivery in 2014, with plenty of opportunities to customise the remainder of the build, from technical specifications to interior design and decor. This 41m is slightly different from her two predecessors in that she has more deck space and different engine options, and the yard tell me that she also features a very high-volume interior and a huge tender garage. Various engine options will give her a top speed of between 21 and 30 knots.